Inspired by our original classic spinners, our darling flying bird spinners feature all the charm of their predecessors but appropriately scaled for travel! Due to overwhelming requests from bird enthusiasts for gift items that will fit in a standard suitcase these birds will fly into your hearts! 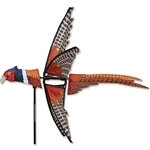 Find your favorite feathered friend from our amazing selection. Each spinner comes with stakes and ground mount. 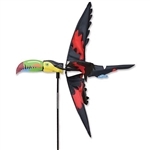 Road Runner WhirliGig Spinner - 28"